Learn to accept unhappiness to understand and appreciate the value of happiness. Happiness is not something you pursue or find. It is who you are. 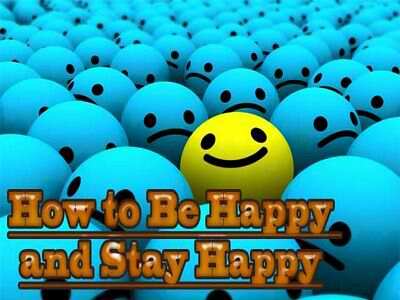 You are happy, you are happiness! For happiness to be visible in you, to you, for the world, you must first understand and then let go of your unhappiness. What makes us unhappy are our circumstances. When what we want doesn’t happen or doesn’t exist we become unhappy. So unhappiness is basically because of our circumstances. But here’s a little secret __ happiness, on the other hand, is possible despiteour circumstances. Understand this clearly. You suffer only when you link your happiness, and make it conditional, to your circumstances. Let’s say, you have a good job and earn a good income and own a good car. So, then, logically, you are happy because of those circumstances! This is dangerous. What happens when any of those conditions is disturbed or changed or doesn’t exist? You lose your job and your income and your car gets taken away by the bank that it was hypothecated to. Then doesn’t your happiness turn into unhappiness? It surely will. When you resist this unhappiness is when your suffering prolongs. Instead accept it. Accept that in Life anything, ANYTHING, can happen. And if you decide that whatever happens you are not going to let it affect your inner core, your happiness, then you will learn the art of being happy despiteyour circumstances. Only one of two things may be true about your Life at any time. You may get what you want. Or you may get what you didn’t want. Intelligent living is about being unmoved despite getting either. Happiness is free of terms and conditions. It is available free. 24x7x365. Because we foolishly, vainly, make it conditional, is why we remain unhappy! Happiness is like oxygen. It is available. But for you to live you must breathe it. If you stop breathing saying your conditions for breathing remain unfulfilled, saying you don’t have this or that or the other, who’s the loser? Who then dies? True happiness is not about jumping up and down because you got what you wanted. True happiness is when your soul laughs at having conquered your mind, at having stilled it even when you got what you didn’t want. True happiness is in being present and simply witnessing Life as it happens. It is about going with the flow of Life, intensely understanding whatever happens, even if it is something you didn’t want or bargain for, and intelligently choosing to remain unmoved. Happiness, simply then, is wanting whatever you get in Life! Author AVIS ViswanathanPosted on May 5, 2013 March 14, 2016 Categories 24x7x365, Art of Living, Happiness, Inner Peace, Intelligent Living, UnhappinessLeave a comment on Happiness: Available – 24x7x365!! !